Suzette has always been a teacher at heart and enjoys sharing her knowledge to help others. She began her journey as an aerobics instructor and graduated from Penn State University with a B.S. in Exercise Science. 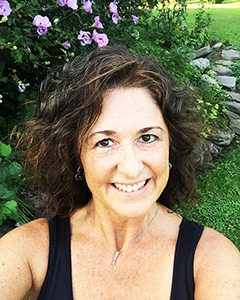 Although her passion for wellness never subsided, a desire to raise a family and teach children how to read, led her to become a Reading Specialist with the Waterloo School District for 17 years. After struggling to find an exercise class that could help with overuse to the knee joints she found the healing care of Dr. Chris Ryan and yoga. “Dr. Chris Ryan and Jenn Salone inspired me with their teaching. I was able to gain strength, flexibility, and understanding of the mind-body connection. I could trust in their knowledge and guidance to help me. The positive energy I felt from each and every class had me hooked!” It then became clear that a new career path was taking hold. She then embarked upon an intense yoga teacher training program as well as courses in mindfulness. It is now her desire to help and inspire others on their wellness journey.